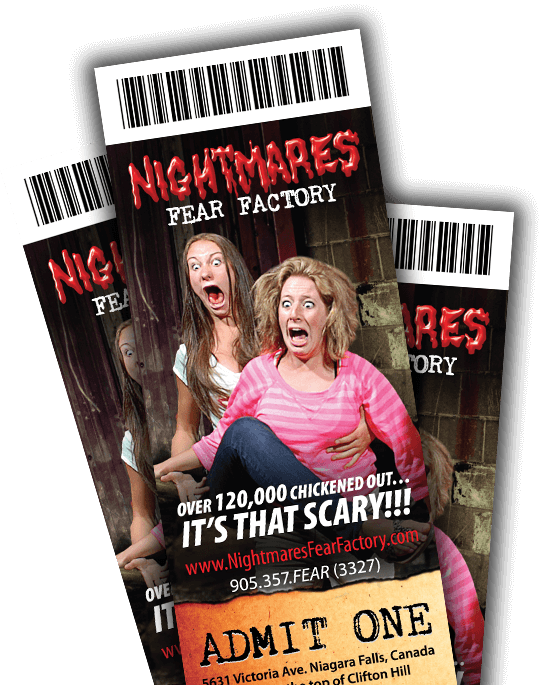 Nightmares Fear Factory in Niagara Falls Canada has been scaring and terrifying people for decades. This haunted house attraction having its roots as a previous coffin factory has captured the unforgettable moments of visitors as they dare to venture through till the end. Of course, not everyone makes it, in fact over 155,000 have chickened out! Everyone loves to document their visit to Niagara Falls with a photo, and we’re no exception. Our images have gained popular attention around the world as we capture their true feelings when going through Nightmares Fear Factory. All documents have been provided below, should you require any additional help please fill out the contact form provided below. Thank you from the Nightmares Fear Factory team, the curators of horror. Download high-resolution, print-ready versions of our logo. High resolution photos are available for all media to use according to the above guidelines.